William Hamilton Longknife is the Pipe Carrier and ceremonial singer from the Osnibi band of the Assiniboine tribe. 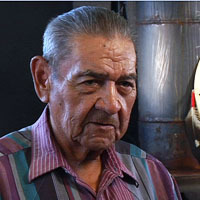 As a tribal elder, Mr. Longknife was able to share his first-hand experiences with 20th century federal policies as well as the significance of oral tradition and history in his interview. Select from video clip link(s) below to view this speaker’s content. Website update and design by Montana Digital Academy.